Swanton senior Bridget Harlett drives to the bucket against Bryan on Friday. Averie Lutz of Swanton gets past a pair of Bryan defenders on her way to the hoop. 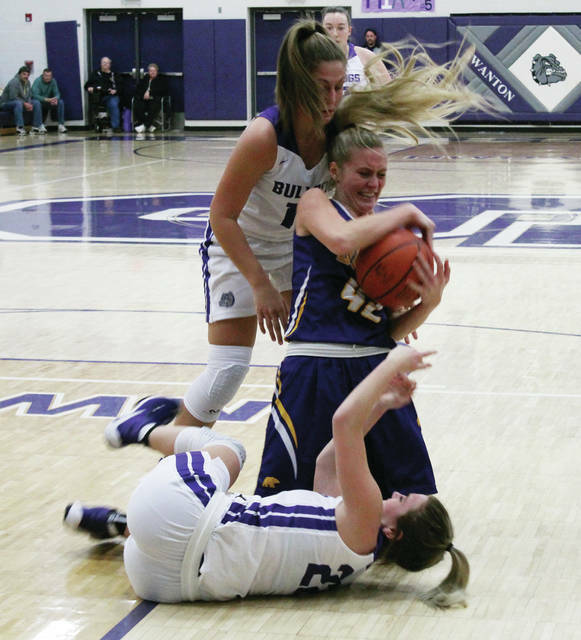 Swanton’s Morgan Pine, standing, and Bridget Harlett fight for a loose ball with Bryan’s McKenna Grube on Friday. 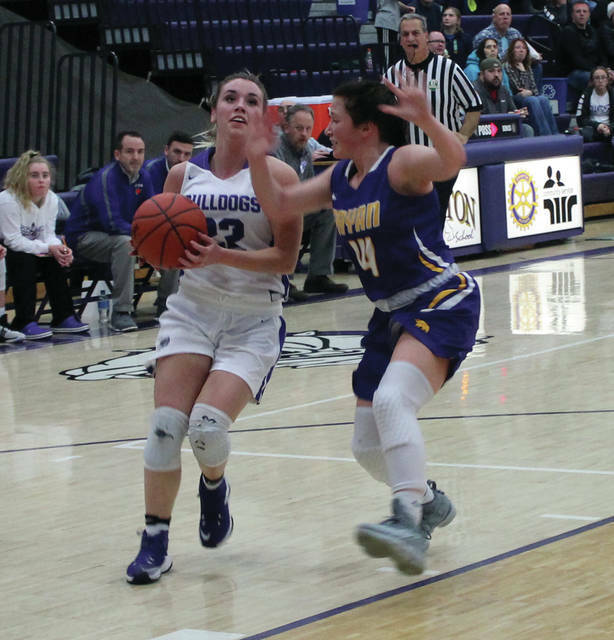 Offense was at a premium and for the Swanton Bulldogs it was almost at a standstill for the last 11:04 of their Northwest Ohio Athletic League girls basketball contest against Bryan Friday at home. 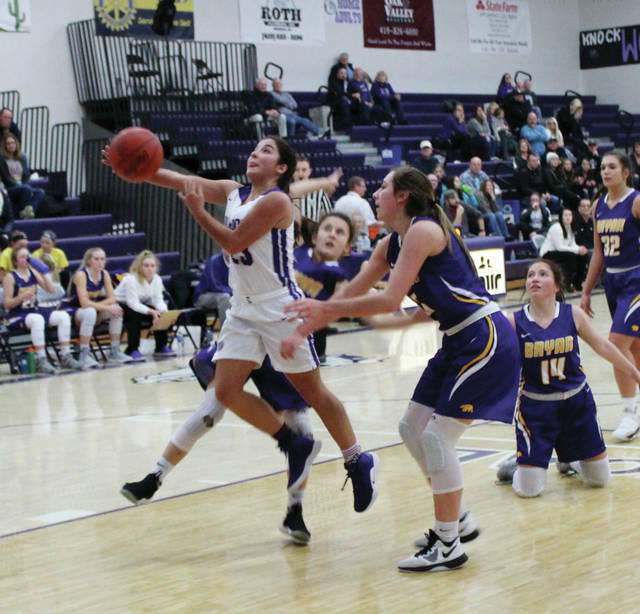 But the Bulldogs overcame that lengthy time where they couldn’t score from the field with a couple of key stops and a critical free throw from Averie Lutz with 28.4 seconds left to hold on to a 33-30 league win over Bryan. The win evens the Bulldogs in the NWOAL at 1-1, while the Golden Bears, one of the pre-season favorites, fell to 0-2. “We made a couple of free throws,” quipped Swanton coach Eric Oakes with a smile. “But they were big free throws. “I give both teams credit, they fought back twice. Our girls found a way to handle the ball good enough and hit a couple free throws to pull out a huge win. Averie Lutz’ five quick points offset Kayla Arnold’s three-ball and McKenna Grube’s score inside, then Grace Oakes and Kennedy Lamberson traded triples before Averie Lutz’ split at the foul line gave the Bulldogs a 9-8 lead with 3:24 to go in the opening quarter. The rest of the stanza became what would be indicative of the rest of the night as both teams went scoreless while committing a total of 14 first quarter turnovers – most of the unforced variety. That trend continued in the second quarter, however, the Bulldogs cashed in early on the Bryan miscues to take an 18-9 lead. This time it was both Averie and Aricka Lutz combining for all nine points, seven of them off Bryan mistakes during the 9-1 run. However, Bryan then took advantage of nine Bulldog second quarter mistakes. The Bears finished the half on a 9-0 comeback, keyed mostly by Shallynn Miley’s five points and a stick back on the glass by McKendry Semer to knot the score at 18-18 at the break. The Bears actually could’ve been up a few at the half but 2 of 11 from the foul line hindered that. The 36 first half points was only marginally ahead of the 29 total turnovers committed by both teams. In the third quarter Swanton again broke free, this time led by Oakes. After an Aricka Lutz drive for a score, Oakes canned a left wing jumper, a fastbreak hoop and a long three-ball from the left side to give the Dogs a 27-20 lead. Morgan Pine’s basket inside and Averie Lutz on a fastbreak put Swanton in what seemed to be control at 31-20 with 3:04 left in the third. Little did anyone know the transition score by Lutz would be the last Swanton basket of the night. Lamberson’s power move got Bryan back to 31-23 at the end of the third, then Semer’s foul line jumper and Lamberson’s hoop from the right wing brought the Bears within 31-27 at the 4:23 mark of the fourth. An Aricka Lutz free throw 90 seconds later was the first Bulldog point in over eight minutes and gave Swanton a 32-27 lead. Lamberson’s drive and 1 of 2 from the stripe closed the gap to a single possession at 32-30 with 1:42 left. Bryan had cracks to tie but misfired twice before Averie Lutz went 1 for 2 with 28.4 to go. The Bears then couldn’t get a clean look at the three and after a timeout with six ticks left had to settle for a heave from about 28 feet out that was wide. Averie Lutz had 14 points to lead all scorers, while Oakes added 10. Lamberson had 10 points for Bryan (5-7, 0-2). 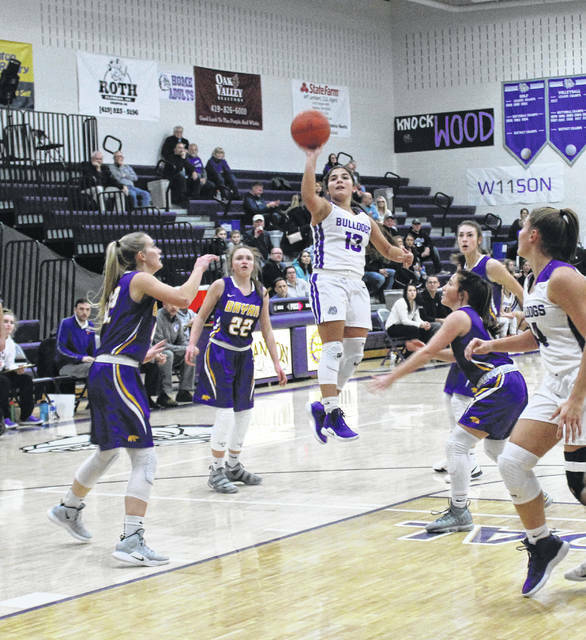 Each team had 22 turnovers and neither shot it very well as Swanton (5-5, 1-1 NWOAL) was 13 for 38 and the Bears went 11 for 43. Swanton hosts Pettisville (10-3) Tuesday and travels to Evergreen (4-7, 2-0) Thursday for an NWOAL contest. https://www.swantonenterprise.com/wp-content/uploads/sites/23/2019/01/web1_Harlett-to-hoop-1.jpgSwanton senior Bridget Harlett drives to the bucket against Bryan on Friday.